Pesto is no longer just for pasta! I love spreading it on whole grain toast, serving it on top of veggies or olives as a mini-appetizer, having it with a baked or sweet potato mixed with cottage cheese or using it in chicken dishes! Pesto can be stored in the freezer using ice cube trays and be warmed for use later. This easy and versatile recipe can be modified –so if you are short on certain ingredients don’t fret. 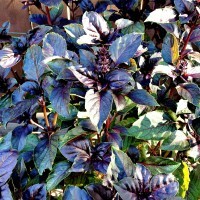 I used both green and purple basil that I have growing in my garden! The purple phytochemical, anthocyanins in the purple basil offers my family and I anti-inflammatory and cancer fighting properties. Place basil leaves and pine nuts into a food processor and pulse several times. Add the garlic, parmesan cheese, and olives then continue to pulse occasionally scraping down the sides of the bowl. Slowly add the oil in a steady stream while the processor is operating. Let me know how you put your pesto to good use! Check out these sandwich spreads including another tasty pesto idea. Join me on Melissa’s Healthy Living facebook page and share your favorite recipe.